[S27] John Wright Boyd, A Family History: Lt. Thomas Fortson (1742-1824) and Some of His Descendants—Early Settler of Elbert County, Georgia (Danielsville, Ga.: Heritage Papers, 1973), p. 502 (stating that Agnes Lizelle Walton and Minnie Walton were sisters and attributing information to Miss Mary Fortson). [S27] John Wright Boyd, A Family History: Lt. Thomas Fortson, etc., above, p. 502 (attributing information to Miss Mary Fortson). [S27] John Wright Boyd, A Family History: Lt. Thomas Fortson (1742-1824) and Some of His Descendants—Early Settler of Elbert County, Georgia (Danielsville, Ga.: Heritage Papers, 1973), p. 502 (attributing information to Miss Mary Fortson). [S312] Social Security Death Index, online at http://tinyurl.com/AncestrySSDI, viewed on 14 Oct 2001 (giving only the date). [S27] John Wright Boyd, A Family History: Lt. Thomas Fortson (1742-1824) and Some of His Descendants—Early Settler of Elbert County, Georgia (Danielsville, Ga.: Heritage Papers, 1973), p. 482 (giving 20 Jan 1900 as her birthdate). [S27] John Wright Boyd, A Family History: Lt. Thomas Fortson, etc., above, p. 482. [S312] Social Security Death Index, online at http://tinyurl.com/AncestrySSDI, viewed on 14 Oct 2001 (not naming the place of death but stating that she lived in Asheville, N.C. when she died). [S27] John Wright Boyd, A Family History: Lt. Thomas Fortson (1742-1824) and Some of His Descendants—Early Settler of Elbert County, Georgia (Danielsville, Ga.: Heritage Papers, 1973), pp. 334 (stating that they married on 11 Oct 1773), 342 (not giving the date). [S27] John Wright Boyd, A Family History: Lt. Thomas Fortson, etc., above, p. 334. [S27] John Wright Boyd, A Family History: Lt. Thomas Fortson, etc., above, pp. 334, 342 (naming Susannah Tate as her mother). [S27] John Wright Boyd, A Family History: Lt. Thomas Fortson (1742-1824) and Some of His Descendants—Early Settler of Elbert County, Georgia (Danielsville, Ga.: Heritage Papers, 1973), p. 342 (naming Richard Fortson as his father). [S27] John Wright Boyd, A Family History: Lt. Thomas Fortson, etc., above, p. 342 (naming Lucy Arnold as his mother). [S27] John Wright Boyd, A Family History: Lt. Thomas Fortson, etc., above, p. 342. [S928] Frances T. Ingmire, comp, Elbert County, Georgia Marriage Records 1804-1859 (St. Louis, Mo. : Frances T. Ingmire, 1985), groom index, p. 14 (giving her name as Elizabeth). [S1022] Jim Perrin, electronic mail to Roger Bartlett, 18 Feb 2005 (giving only the year and not naming the place). [S1183] Macon Weekly Telegraph, Macon, Ga., 2 Jan 1830, p. 2 (listed among divorces granted in November-December 1829 by the Legislature of Georgia). [S27] John Wright Boyd, A Family History: Lt. Thomas Fortson, etc., above, p. 343 (naming William Fortson as his father). [S1022] Jim Perrin, electronic mail to Roger Bartlett, 18 Feb 2005 (naming William Richard Fortson as his father). [S27] John Wright Boyd, A Family History: Lt. Thomas Fortson, etc., above, p. 343 (naming William Fortson as her father). [S1022] Jim Perrin, electronic mail to Roger Bartlett, 18 Feb 2005 (naming William Richard Fortson as her father). [S27] John Wright Boyd, A Family History: Lt. Thomas Fortson (1742-1824) and Some of His Descendants—Early Settler of Elbert County, Georgia (Danielsville, Ga.: Heritage Papers, 1973), pp. 342, 354 (naming Richard Fortson as his father). [S27] John Wright Boyd, A Family History: Lt. Thomas Fortson, etc., above, pp. 342, 354 (naming Lucy Arnold as his mother). [S27] John Wright Boyd, A Family History: Lt. Thomas Fortson, etc., above, pp. 342, 354 (stating that he was born circa 1802 without naming the place). [S961] Find A Grave, online at http://www.findagrave.com, memorial for viewed on 29 Apr 2004 (grave of Tavner Wynn Fortson). [S27] John Wright Boyd, A Family History: Lt. Thomas Fortson, etc., above, pp. 338 (stating that they married on 2 Dec 1824 without naming the place), 354 (stating that they married on 2 Dec 1824 in Elbert Co., Ga.). [S928] Frances T. Ingmire, comp, Elbert County, Georgia Marriage Records 1804-1859 (St. Louis, Mo. : Frances T. Ingmire, 1985), groom index, p. 14 (spelling his name as Tavanah). [S27] John Wright Boyd, A Family History: Lt. Thomas Fortson, etc., above, pp. 338 (stating that they married on 13 Sep 1827 without naming the place), 354 (stating that they married on 13 Sep 1827 in Elbert Co., Ga.). [S1062] Betty Arnold Henderson, electronic mail to Roger Bartlett, 19 Jan 2006. [S27] John Wright Boyd, A Family History: Lt. Thomas Fortson, etc., above, pp. 338, 342, 354-55. [S1062] Betty Arnold Henderson, electronic mail to Roger Bartlett, 19 Jan 2006, (stating that his two wives were first cousins). [S1172] Eugenia Hobday, electronic mail to e-mail address, 6 Feb 2008, (spelling his name as Tavernor and stating that he moved to Alabama and then to Texas). [S27] John Wright Boyd, A Family History: Lt. Thomas Fortson, etc., above, p. 354 (naming Tavner W. Fortson as her father). [S1062] Betty Arnold Henderson, electronic mail to Roger Bartlett, 19 Jan 2006, (naming Tavner Winn Fortson as his father). [S1062] Betty Arnold Henderson, electronic mail to Roger Bartlett, 19 Jan 2006, (naming Tavner Winn Fortson as her father). [S27] John Wright Boyd, A Family History: Lt. Thomas Fortson (1742-1824) and Some of His Descendants—Early Settler of Elbert County, Georgia (Danielsville, Ga.: Heritage Papers, 1973), pp. 342, 355 (naming Richard Fortson as her father). [S27] John Wright Boyd, A Family History: Lt. Thomas Fortson, etc., above, pp. 342, 355 (naming Lucy Arnold as her mother). [S27] John Wright Boyd, A Family History: Lt. Thomas Fortson, etc., above, pp. 342, 355. [S928] Frances T. Ingmire, comp, Elbert County, Georgia Marriage Records 1804-1859 (St. Louis, Mo. : Frances T. Ingmire, 1985), bride index, p. 14. [S27] John Wright Boyd, A Family History: Lt. Thomas Fortson, etc., above, pp. 338 (stating that they married on 23 Oct 1823 without naming the place), 355 (stating that they married on 27 Oct 1823 in Elbert Co., Ga.). [S27] John Wright Boyd, A Family History: Lt. Thomas Fortson, etc., above, p. 355. [S27] John Wright Boyd, A Family History: Lt. Thomas Fortson, etc., above, p. 355 (naming Sarah Fortson as his mother). [S27] John Wright Boyd, A Family History: Lt. Thomas Fortson, etc., above, pp. 342 (stating that she was born circa 1806 without naming the place), 355 (stating that she was born circa 1806 in Elbert Co., Ga.). [S27] John Wright Boyd, A Family History: Lt. Thomas Fortson, etc., above, pp. 338 (stating that they married on 20 Dec 1827 without naming the place), 355 (stating that they married on 20 Dec 1827 in Elbert Co., Ga.). [S1172] Eugenia Hobday, electronic mail to e-mail address, 6 Feb 2008. [S27] John Wright Boyd, A Family History: Lt. Thomas Fortson, etc., above, p. 355 (naming Mary ['Polly'] Fortson as his mother). [S1011] Eugenia Hobday, electronic mail to e-mail address, 20 Nov 2004, (naming Mary Fortson as his mother). [S27] John Wright Boyd, A Family History: Lt. Thomas Fortson, etc., above, p. 355 (naming Mary ['Polly'] Fortson as her mother). [S27] John Wright Boyd, A Family History: Lt. Thomas Fortson, etc., above, p. 355 (stating that Mary Fortson Turman and William A. Barham possibly had a daughter named Sarah Fortson Barham). [S27] John Wright Boyd, A Family History: Lt. Thomas Fortson (1742-1824) and Some of His Descendants—Early Settler of Elbert County, Georgia (Danielsville, Ga.: Heritage Papers, 1973), p. 531 (naming Mildred Fortson as his mother). [S27] John Wright Boyd, A Family History: Lt. Thomas Fortson, etc., above, p. 531 (naming Helton Baker as his father). [S27] John Wright Boyd, A Family History: Lt. Thomas Fortson (1742-1824) and Some of His Descendants—Early Settler of Elbert County, Georgia (Danielsville, Ga.: Heritage Papers, 1973), pp. 342, 531 (naming Richard Fortson as her father). [S27] John Wright Boyd, A Family History: Lt. Thomas Fortson, etc., above, pp. 342, 531 (naming Lucy Arnold as her mother). [S27] John Wright Boyd, A Family History: Lt. Thomas Fortson, etc., above, p. 531. [S27] John Wright Boyd, A Family History: Lt. Thomas Fortson, etc., above, pp. 342 (stating that she lived in Columbus, Ga.), 531 (stating that she died at sister Susan's home in Opelika, Ala.). [S27] John Wright Boyd, A Family History: Lt. Thomas Fortson, etc., above, p. 531 (naming Mildred Fortson as his mother). [S27] John Wright Boyd, A Family History: Lt. Thomas Fortson, etc., above, pp. 342 (stating that she was born in 1812 without naming the place), 531 (stating that she was born in 1812 without naming the place, citing 1958 letter from Mrs. H. M. Smith, New York, N.Y., to John Wright Boyd). [S27] John Wright Boyd, A Family History: Lt. Thomas Fortson, etc., above, pp. 342 (not giving the date), 531 (stating that they married "on or before 1836-7 when Andrew respresented his wife in the administration of her father's will"). [S962] Delilah _____, electronic mail to e-mail address, 20 May 2004, (stating that they married in 1832). [S27] John Wright Boyd, A Family History: Lt. Thomas Fortson, etc., above, p. 531 (stating that she died in 1890, citing 1958 letter from Mrs. H. M. Smith, New York, N.Y., to John Wright Boyd). [S27] John Wright Boyd, A Family History: Lt. Thomas Fortson, etc., above, pp. 342, 531. [S27] John Wright Boyd, A Family History: Lt. Thomas Fortson, etc., above, p. 531 (naming Susan Tate Fortson as her mother, citing 1958 letter from Mrs. H. M. Smith, New York, N.Y., to John Wright Boyd). [S962] Delilah _____, electronic mail to e-mail address, 20 May 2004, (naming Susan Tate Fortson as his mother). [S962] Delilah _____, electronic mail to e-mail address, 20 May 2004, (naming Susan Tate Fortson as her mother). [S27] John Wright Boyd, A Family History: Lt. Thomas Fortson (1742-1824) and Some of His Descendants—Early Settler of Elbert County, Georgia (Danielsville, Ga.: Heritage Papers, 1973), p. 342 (naming Richard Fortson as her father). [S27] John Wright Boyd, A Family History: Lt. Thomas Fortson, etc., above, p. 342 (naming Lucy Arnold as her mother). [S27] John Wright Boyd, A Family History: Lt. Thomas Fortson, etc., above, p. 532. [S27] John Wright Boyd, A Family History: Lt. Thomas Fortson, etc., above, p. 532 (naming Elizabeth Fortson as her mother). [S27] John Wright Boyd, A Family History: Lt. Thomas Fortson, etc., above, p. 532 (naming Elizabeth Fortson as his mother). [S27] John Wright Boyd, A Family History: Lt. Thomas Fortson (1742-1824) and Some of His Descendants—Early Settler of Elbert County, Georgia (Danielsville, Ga.: Heritage Papers, 1973), pp. 342, 532 (naming Richard Fortson as his father). [S27] John Wright Boyd, A Family History: Lt. Thomas Fortson, etc., above, pp. 342, 532 (naming Lucy Arnold as his mother). [S27] John Wright Boyd, A Family History: Lt. Thomas Fortson, etc., above, pp. 342 (stating that he was born on 9 Mar 1818 without naming the place), 532 (stating that he was born on 9 Mar 1818 in Elbert Co., Ga.). [S27] John Wright Boyd, A Family History: Lt. Thomas Fortson, etc., above, pp. 533, 671. [S27] John Wright Boyd, A Family History: Lt. Thomas Fortson, etc., above, p. 535 (citing 20 Apr 1967 letter from Catherine Smith, Homer, La., to John Wright Boyd about her visit to Antioch Church Cemetery). [S27] John Wright Boyd, A Family History: Lt. Thomas Fortson, etc., above, pp. 338 (stating that they were cousins), 342 (stating that they moved to Troup Co., Ga. and then to Louisiana), 532 (stating that they were in Harris Co., Ga. in 1850 and later moved to Louisiana). [S27] John Wright Boyd, A Family History: Lt. Thomas Fortson, etc., above, pp. 533, 546 (naming James Thomas Fortson as his father). [S27] John Wright Boyd, A Family History: Lt. Thomas Fortson, etc., above, p. 533 (naming James Thomas Fortson as his father). [S27] John Wright Boyd, A Family History: Lt. Thomas Fortson, etc., above, p. 533 (naming James Thomas Fortson as her father). Other Names*: Eliza Lane Fortson, Eliza Fortson, Eliza Lane Fortson Dortch, Eliza Lane Dortch, Eliza Fortson Dortch, Eliza Dortch. [S27] John Wright Boyd, A Family History: Lt. Thomas Fortson (1742-1824) and Some of His Descendants—Early Settler of Elbert County, Georgia (Danielsville, Ga.: Heritage Papers, 1973), p. 342 (naming Thomas Lane as her father). [S27] John Wright Boyd, A Family History: Lt. Thomas Fortson, etc., above, p. 342 (naming _____ Haley as her mother). [S27] John Wright Boyd, A Family History: Lt. Thomas Fortson, etc., above, p. 343 (not giving the date or place or his first name). [S1022] Jim Perrin, electronic mail to Roger Bartlett, 18 Feb 2005. [S27] John Wright Boyd, A Family History: Lt. Thomas Fortson, etc., above, p. 343 (naming Eliza Lane as his mother). [S1022] Jim Perrin, electronic mail to Roger Bartlett, 18 Feb 2005 (naming Eliza Lane as his mother). [S27] John Wright Boyd, A Family History: Lt. Thomas Fortson, etc., above, p. 343 (naming Eliza Lane as her mother). [S1022] Jim Perrin, electronic mail to Roger Bartlett, 18 Feb 2005 (naming Eliza Lane as her mother). Marriage*: He married Nancy Haley, daughter of William Haley and Mary Turman. [S972] Jim Perrin, electronic mail to e-mail address, 21 Jan 2004, (naming Thomas Lane as his father). Marriage*: She married Thomas Lane. [S27] John Wright Boyd, A Family History: Lt. Thomas Fortson (1742-1824) and Some of His Descendants—Early Settler of Elbert County, Georgia (Danielsville, Ga.: Heritage Papers, 1973), p. 342 (naming William Haley as her father). [S972] Jim Perrin, electronic mail to e-mail address, 21 Jan 2004, (stating that Eliza Lane Fortson Dortch was the sister of John Allen Lane and that he was the son of Thomas Lane). [S27] John Wright Boyd, A Family History: Lt. Thomas Fortson, etc., above, p. 342 (naming Mary Turman as her mother). [S972] Jim Perrin, electronic mail to e-mail address, 21 Jan 2004, (stating that Eliza Lane Fortson Dortch was the sister of John Allen Lane and that he was the son of "Nancy Haley (Healey)"). [S972] Jim Perrin, electronic mail to e-mail address, 21 Jan 2004, (naming "Nancy Haley (Healey)" as his mother). Marriage*: He married Mary Turman. Marriage*: She married William Haley. [S27] John Wright Boyd, A Family History: Lt. Thomas Fortson (1742-1824) and Some of His Descendants—Early Settler of Elbert County, Georgia (Danielsville, Ga.: Heritage Papers, 1973), p. 342 (naming Mary Turman as her mother). [S1022] Jim Perrin, electronic mail to Roger Bartlett, 18 Feb 2005 (naming Nathan Dortch as his father). [S1022] Jim Perrin, electronic mail to Roger Bartlett, 18 Feb 2005 (naming Elizabeth Carroll as his mother). [S27] John Wright Boyd, A Family History: Lt. Thomas Fortson (1742-1824) and Some of His Descendants—Early Settler of Elbert County, Georgia (Danielsville, Ga.: Heritage Papers, 1973), p. 343 (not giving the date or place or his first name). Marriage*: He married Margaret Bush. [S683] Louis Henneberg, electronic mail to Roger Bartlett, 23 Oct 2001. [S683] Louis Henneberg, electronic mail to Roger Bartlett, 23 Oct 2001, (giving her name as Sarah and naming Congrave Jackson as her father). Marriage*: She married Congrave Jackson. [S683] Louis Henneberg, electronic mail to Roger Bartlett, 23 Oct 2001, (giving her name as Sarah and naming Margaret Bush as her mother). [S683] Louis Henneberg, electronic mail to Roger Bartlett, 23 Oct 2001, (naming Ambrose Callaway as his father). [S1038] Mrs. M. L. Smoot, The Callaway Family (1930), Callaway Family Association web site, http://www.callawayfamily.org/document/…, (naming Ambrose Callaway as his father). [S683] Louis Henneberg, electronic mail to Roger Bartlett, 23 Oct 2001, (naming Sarah Jackson as his mother). [S1038] Mrs. M. L. Smoot, The Callaway Family (1930), above, (naming Susan Jackson as his mother). [S683] Louis Henneberg, electronic mail to Roger Bartlett, 23 Oct 2001, (stating that he was born in 1825 in Howard County, Missouri). [S1038] Mrs. M. L. Smoot, The Callaway Family (1930), above. [S683] Louis Henneberg, electronic mail to Roger Bartlett, 23 Oct 2001, (not giving the date). [S1038] Mrs. M. L. Smoot, The Callaway Family (1930), above, (giving her name as Eliza Ann Jeffries). [S683] Louis Henneberg, electronic mail to Roger Bartlett, 23 Oct 2001, (naming John J. Callaway as her father). [S1038] Mrs. M. L. Smoot, The Callaway Family (1930), above, (naming John Jackson Callaway as her father). [S683] Louis Henneberg, electronic mail to Roger Bartlett, 23 Oct 2001, (naming John J. Callaway as his father). [S1032] The Callaway Family Association CFANET e-Newsletter, Oct 2004, attributing information to Con Carrell Callaway. [S1049] Rozella Cline and Ellen M. De Vries, comps., Index of Fairburn Cemetary, Jefferson County, Nebraska (n.p. : n.pub., 1987), p. 6. [S683] Louis Henneberg, electronic mail to Roger Bartlett, 23 Oct 2001, (stating that he was born in 1837 in Carroll County, Missouri). [S1032] The Callaway Family Association CFANET e-Newsletter, Oct 2004, attributing information to Con Carrell Callaway (giving information about Civil War service and homestead in Nebraska). [S1032] The Callaway Family Association CFANET e-Newsletter, Oct 2004, attributing information to Con Carrell Callaway (naming Congrave Clinton Callaway as his father). [S683] Louis Henneberg, electronic mail to Roger Bartlett, 23 Oct 2001, (naming Ambrose Callaway as her father). [S1038] Mrs. M. L. Smoot, The Callaway Family (1930), Callaway Family Association web site, http://www.callawayfamily.org/document/…, (naming Ambrose Callaway as her father). [S683] Louis Henneberg, electronic mail to Roger Bartlett, 23 Oct 2001, (naming Sarah Jackson as her mother). [S1038] Mrs. M. L. Smoot, The Callaway Family (1930), above, (naming Susan Jackson as her mother). [S683] Louis Henneberg, electronic mail to Roger Bartlett, 23 Oct 2001, (stating that she was born in 1843 in Carroll County, Missouri). [S685] e-mail address, electronic mail to Roger Bartlett, 24 Oct 2001, (stating that he was the brother of Adam Rickard and citing "information from Mason County WV"). [S685] e-mail address, electronic mail to Roger Bartlett, 24 Oct 2001, (naming Adam Rickard as his father and citing "information from Mason County WV"). Marriage*: She married Adam Rickard. [S685] e-mail address, electronic mail to Roger Bartlett, 24 Oct 2001, (citing "information from Mason County WV"). [S1038] Mrs. M. L. Smoot, The Callaway Family (1930), Callaway Family Association web site, http://www.callawayfamily.org/document/…, (giving her name as Eliza Ann Jeffries). [S683] Louis Henneberg, electronic mail to Roger Bartlett, 23 Oct 2001, (naming Elizabeth A. Jeffries as her mother). [S1038] Mrs. M. L. Smoot, The Callaway Family (1930), above, (naming Eliza Jeffries as her mother). [S683] Louis Henneberg, electronic mail to Roger Bartlett, 23 Oct 2001, (naming Elizabeth A. Jeffries as his mother). [S1038] Mrs. M. L. Smoot, The Callaway Family (1930), Callaway Family Association web site, http://www.callawayfamily.org/document/…, (naming John Jackson Callaway as her father). [S683] Louis Henneberg, electronic mail to Roger Bartlett, 23 Oct 2001, (stating that she was born in 1856 in Carroll County, Missouri). [S1038] Mrs. M. L. Smoot, The Callaway Family (1930), above, (giving the date but not the place). [S1038] Mrs. M. L. Smoot, The Callaway Family (1930), above, (naming Elizabeth Jeffries Callaway as his mother). [S1038] Mrs. M. L. Smoot, The Callaway Family (1930), above, (naming Elizabeth Jeffries Callaway as her mother). [S683] Louis Henneberg, electronic mail to Roger Bartlett, 23 Oct 2001, (stating that he was born in 1859 in Carroll County, Missouri). [S1038] Mrs. M. L. Smoot, The Callaway Family (1930), Callaway Family Association web site, http://www.callawayfamily.org/document/…, (giving the date but not the place). [S1038] Mrs. M. L. Smoot, The Callaway Family (1930), above, (naming Ambrose Callaway, Jr. as his father). [S1038] Mrs. M. L. Smoot, The Callaway Family (1930), above, (naming Ambrose Callaway, Jr. as her father). [S683] Louis Henneberg, electronic mail to Roger Bartlett, 23 Oct 2001, (stating that he was born in 1869 in Carroll County, Missouri). 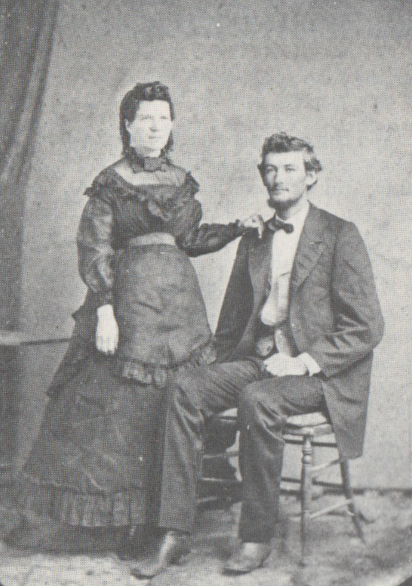 James Madison Bell with his wife, Miriam York Bell, from The History of Dewitt County, Texas. [S748] Margaret Sturges, "James Madison Bell," in The Dewitt County Hist. Comm., The History of Dewitt County, Texas (n.p. : Curtis Media Corp., 1991), p. 280 (naming William Bell as his father). [S748] Margaret Sturges, "James Madison Bell," above (naming Julia Johnson as his mother). [S748] Margaret Sturges, "James Madison Bell," above. [S748] Margaret Sturges, "James Madison Bell," above (naming James Madison Bell as her father). [S748] Margaret Sturges, "James Madison Bell," above (naming James Madison Bell as his father). [S686] Virginia Provost, electronic mail to Roger Bartlett, 22 Oct 2001 (naming James Madison Bell as his father). [S749] Margaret Sturges, "James Robert Bell," in The Dewitt County Hist. Comm., The History of Dewitt County, Texas (n.p. : Curtis Media Corp., 1991), p. 280 (naming James Madison Bell as his father). Miriam Bell with her husband, James Madison Bell, from The History of Dewitt County, Texas. [S748] Margaret Sturges, "James Madison Bell," in The Dewitt County Hist. Comm., The History of Dewitt County, Texas (n.p. : Curtis Media Corp., 1991), p. 280 (naming Capt. John York as her father). [S748] Margaret Sturges, "James Madison Bell," above (naming Lutitia Cain as her mother). [S748] Margaret Sturges, "James Madison Bell," above (naming Miriam York as her mother). [S748] Margaret Sturges, "James Madison Bell," above (naming Miriam York as his mother). [S408] Emmett L. Whitsett, Jr., San Antonio, Tex., descendancy chart for Frances Mary McFadin Pullen sent to Roger Bartlett, 26 Mar 1998 (naming Miriam York as his mother). [S686] Virginia Provost, electronic mail to Roger Bartlett, 22 Oct 2001 (naming Miriam York as his mother). [S749] Margaret Sturges, "James Robert Bell," in The Dewitt County Hist. Comm., The History of Dewitt County, Texas (n.p. : Curtis Media Corp., 1991), p. 280 (naming Miriam York as his mother). [S686] Virginia Provost, electronic mail to Roger Bartlett, 22 Oct 2001 (naming James Robert Bell as his father). [S749] Margaret Sturges, "James Robert Bell," in The Dewitt County Hist. Comm., The History of Dewitt County, Texas (n.p. : Curtis Media Corp., 1991), p. 280 (naming James Robert Bell as his father). [S686] Virginia Provost, electronic mail to Roger Bartlett, 22 Oct 2001 (naming Mary Eliza Pullen as his mother). [S749] Margaret Sturges, "James Robert Bell," above (naming Mary Eliza Pullen as his mother). [S686] Virginia Provost, electronic mail to Roger Bartlett, 22 Oct 2001. [S749] Margaret Sturges, "James Robert Bell," above. [S686] Virginia Provost, electronic mail to Roger Bartlett, 22 Oct 2001 (giving only the year and not naming the place). [S749] Margaret Sturges, "James Robert Bell," above (giving only the year and not naming the place). [S11] Index to Texas Death Records (Austin, Tex. : Tex. Dept. of Health, Bur. of Vital Statistics), typescript, 1903-40, vol. 4, p. 1752, file 27512. [S11] Index to Texas Death Records (Austin, Tex. : Tex. Dept. of Health, Bur. of Vital Statistics), typescript, 1941-45, vol. 1, p. 356, file 31666. [S686] Virginia Provost, electronic mail to Roger Bartlett, 22 Oct 2001 (naming James Robert Bell as her father). [S749] Margaret Sturges, "James Robert Bell," in The Dewitt County Hist. Comm., The History of Dewitt County, Texas (n.p. : Curtis Media Corp., 1991), p. 280 (naming James Robert Bell as her father). [S686] Virginia Provost, electronic mail to Roger Bartlett, 22 Oct 2001 (naming Mary Eliza Pullen as her mother). [S749] Margaret Sturges, "James Robert Bell," above (naming Mary Eliza Pullen as her mother). [S11] Index to Texas Death Records (Austin, Tex. : Tex. Dept. of Health, Bur. of Vital Statistics), typescript, 1903-40, vol. 55, p. 27140, file 11807. [S686] Virginia Provost, electronic mail to Roger Bartlett, 22 Oct 2001 (naming Carey McNelly Bell as her mother).